Hillary Clinton is mulling a 2020 run—and some think she’ll win. Yeah, how many times have we heard this about Lady Macbeth? The Clinton machine was supposed to make mincemeat of Barack Obama. They were expected to cream Donald J. Trump. In both cases, its pursuit ended in abject failure. Now, is it third time’s the charm? We’ve already gone through why Hillary 4.0—yeah, that’s what they’re calling it—will fail. The progressive base, a sizable and ascendant wing of the Democratic Party, is through with her. 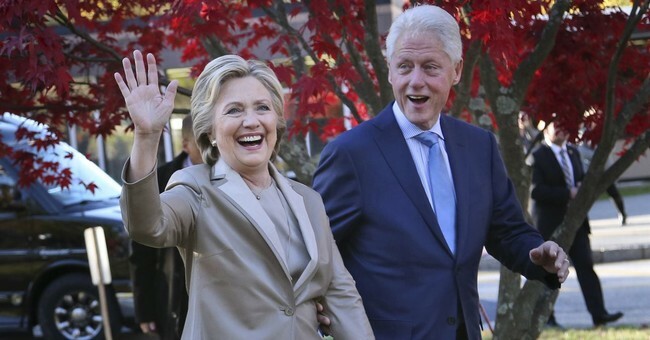 She’s yesterday’s news—and there’s definitely a feeling that the party needs to move on from the Clintons. This chapter in American politics is over. At the same time, she’s the only person who has a national constituency. She has name-recognition. And even with all that, she would still probably lose to Donald Trump in 2020. The roots of that defeat are pretty obvious in retrospect. People didn't like Trump. But they didn't like Clinton any better. People didn't trust Trump or think he was honest. But they felt the exact same way about Clinton. In the end, people voted for Trump -- and, yes, Clinton won the popular vote by almost 3 million -- because they wanted RADICAL change. And he was that change. Clinton was, well, more of the same. Here's a number that tells the story of that election: Almost 4 in 10 voters said that the most important thing about a candidate for them was that he or she could bring about needed change in the country. Trump got 82% of the vote among that group. Clinton got 14%. Now, ask yourself this: What's changed? I'll answer that one for you: Not a hell of a lot. If anything, Clinton is in a worse position, politically speaking, than she was back then. According to Gallup polling in September, just 36% of people have a favorable view of Hillary Clinton. That's down 7 points from where it stood just before the 2016 election and is tied for her lowest favorable rating ever in Gallup polling. Some of the low regard in which Clinton is held is tied to the devastating efficacy of Trump's "Crooked Hillary" attacks. Some likely has to do with her decision to remain a vocal and high-profile critic of the president after losing. Some -- much? -- of it has to do with the fact that negative feelings about Clinton are baked into the electorate and just will never change. That deep-seated negative opinion about Clinton is at the center of why she would be a very poor choice for Democrats in 2020. Clinton's many years in the public eye -- and the many questions raised about her time in public life -- allowed Trump to make the election a referendum on her and her baggage rather than on him and his own deep flaws as a person and a politician. For once, CNN is right on the money. At the same time, the Clintons are egomaniacs. Hillary sure as hell thinks she’s entitled to be president. I hope her appalling lack of political awareness leads to her running again. We would win, and I’m going to bet by larger margins than in 2016.